ADA, Okla. – Ben Walton is no stranger to danger. As a United States Marine, Walton saw plenty of action during four tours of duty in Afghanistan and Iraq. He served 10 years in harm’s way and knows exactly what it takes to stand against the enemy. Now, he’ll face a different type of foe: the Spanish fighting bull. Walton is one of 25 men set to compete during the third annual Bullfighters Only Ada Invitational, set for 7:30 p.m. on Friday and Saturday at the Pontotoc County Agri-Plex. “There are a lot of similarities as far as mindset in warfare and in bullfighting,” said Walton, 35 of Amherst, Virginia. “You have to have this never-say-die mentality. You have to fight your way out of situations. 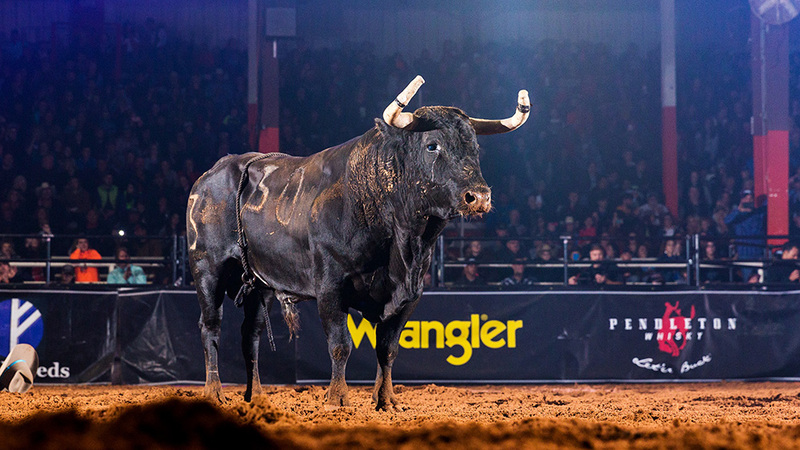 Fifteen athletes are set to compete in Friday’s Qualifier Round, with only five advancing to Saturday to compete against the top ten bullfighters in the BFO. The top score in Saturday’s Hooey Championship Round will be crowned the Ada Invitational champion and will earn the lion’s share of the $30,000 purse. Walton is one of several newcomers who are testing their skills for the first time in the BFO this weekend. In fact, he was invited to compete after an impressive showing at the BFO Development Camp this past weekend in Lavonia, Georgia. “This is truly an honor,” he said. “I’m very excited about this opportunity and very thankful for the BFO to allow me to be part of this. I will try to lay it all on the line and see what happens. Hill is a BFO Pioneer who has helped in returning freestyle bullfighting to the mainstream of Western sports. Besides being a key instructor at the Development Camps, he also is a contender for the world championship, having finished fifth in the Pendleton Whisky World Standings last season. Walton isn’t the only newcomer who will compete in Ada. Rowdy Moon is a 21-year-old bullfighter from Taylor, Nebraska, who hasn’t competed in many freestyle events. He started bullfighting eight years ago, attending a bullfighting school in Nebraska that happened to be instructed by Aaron Ferguson, BFO’s eventual founder and CEO. “When Rowdy showed up, he was 13-years-old and couldn’t have weighed 100 pounds,” Ferguson said. “We were scared to let him fight, but he was an absolute natural. It’s all come full circle in a short amount of time for Moon, who was part of the Development Camp in Houston just two weeks ago. Now he’s competing in his first BFO event, and the magnitude isn’t lost on him. “I learned a lot of stuff that I never picked up on,” he said. “The camps are awesome, because it’s a really cool environment. Everybody’s feeding off each other’s success. Everyone’s really motivated, so they lift you up. The feeling is natural; Moon is getting called straight to the Major Leagues. This will be something unlike he has ever seen. Freestyle bullfighting is a true man-vs.-beast showcase of aggression, agility and flat-out unbelievable athletic maneuvers. Each bout lasts 60 seconds, and scores are based on a 100-point scale. Half of the score is determined by how well the bullfighter moves around and jumps over the animal. The Spanish fighting bull earns up to 50 points based his aggression and how well it stays engaged during the fight. Walton has seen it from afar. Now he’s in the middle of it and is already anticipating the feeling he will get this weekend. “I think the BFO is an awesome organization,” said Walton, who also helps on his family’s ranch in western Virginia. “I think the mentality of the guys is such a brotherhood. They’re competing against one another, but there’s a lot of comradery there. I saw it in a lot of the guys and the instructors.